SketchUp has tools and plugins that add a touch of reality to the design. The presentation of SketchUp distinguishes the application from others as it successfully brings the reality of 3D design to you. The material box, as the name defines, gives color effects to the design. Material dialog box appears differently in the windows and Mac versions. 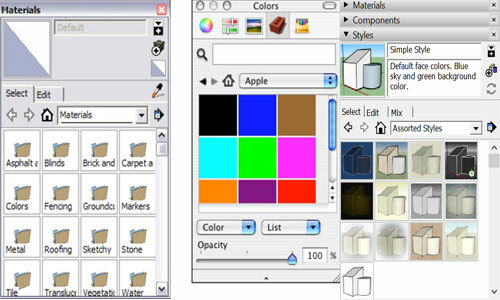 Generally, two types of materials (colors and textures) are available in the SketchUp dialog box and you can apply either one as per your need. Solid colors are available in the dialog box and you cannot use the gradients. You can make the color of your choice. Texture in SketchUp is a small image that is applied to the face of your design until the face gets completely covered by the image. For example, if you want to design a brick face, you need to click the brick icon image several times to fill up the surface. There are many textures available in SketchUp, and they indeed add an interesting touch to the design. If the already existed list seems not enough, you can download more from Google SketchUp website. You can also download paid textures and can make your own format. • You can make the materials translucent by adjusting the opacity slider. This adds a clear visibility to your model in the Windows. • Textures have transparent areas also that allow you to see through the faces you are texturing on. The black spaces on the texture may look inappropriate, but they come up with a wide range of benefits. • You can also edit a material as per your choice. This is basically the work of the advanced designers and they know how to handle the materials properly to make a perfect 3D model. • Photo texturing is another thing that will help you get the model as per your expectation. You can apply photos instead of colors and textures to cover the surfaces of your design. This feature brings in a new change in the work flow and pushes the limits. Those building models for Google earth will take benefits from this feature. These are the few things about dialog box that make your designer easier and simpler. This feature gives your 3D design a complete sense. Natale Zappia has developed nz_Gradients&Driveways. It is the newest sketchup extension that supports SketchUp 2016, SketchUp 2017, SketchUp 2018 as well as Mac OS X and Windows platform. The plugin is suitable for different industries like Architecture, Construction, Education, Engineering, Heavy Civil, Landscape Architecture, Urban Planning etc. The plugin is used to define the necessary gradients & transition zones toward your driveways & vehicular access ramps. This extensions help in computing or transforming gradients into falls (1/distance), % grades or .deg. Visually calculate as well as label a grade among any two points. Indicate Local Authorities and Legal Requirements. Personalize/Override/Elaborate on the CODE settings to meet your specific needs. This tool can be applied to draw a ramp to the maximum permissible grade. If the grade surpasses the permissible grade then the tool will automatically compute and draw an appropriate ramp with the necessary transition zones, with reference to CODE and USER settings. Under this situation, it will also relate priorities the Drop(RL) or the Length with regard to your optional preference. Natale Zappia develops nz_ConvertMe, the newest extension available in extension warehouse. The extension can be used for the mass-conversion of Groups and Component to compare with component Identity, it is also applicable for the mass-conversion of Components to Groups and vice-versa. The plugin supports SketchUp 2016, SketchUp 2017 and SketchUp 2018.
nz_ConvertMe: This extension allows for the mass-conversion of Groups and Component to tally a previously selected Component Identity, it also facilitates the mass-conversion of Components to Groups and vice-versa. With this plugin, the users will be able to remove various tedious steps by obtaining the desired end result directly. ConvertMe To Components: Transform all groups inside a selection into individual components. Remember that the axes are now put to world axes as is normally the case inside the Sketchup Environment. The components which prevail previously inside the selection will stay intact. Natale Zappia has developed nz_PolyhedralJunctions. This newest sketchup extension is well matched with SketchUp 2016, SketchUp 2017 and SketchUp 2018. The plugin is specifically designed for Architecture, Construction, Education, Engineering etc. NZ_PolyhedronJunctions comprises of nz_Edge2Polygon to generate Polygons and Polyhedral Junctions maintaining perfect reference edge lengths. It also articulates & connects triangles. It allows the user to generate and personalize platonic/polyhedrons and archimedean solids as per your exact dimensions and requirements from the ground up devoid of depending on external imports. Polyhedral Juctions of the platonics are set all through nature and most effective while arranging balanced loads concerning a point. This tools match well when anyone is going to generate self-similar compositions. Natale Zappia has developed nz_Implode, the newest sketchup extension developed by Natale Zappia. This extension is well suited with SketchUp 2016, SketchUp 2017, SketchUp 2018. The extension is suitable for different types of industries like Architecture, Construction, Education, Engineering, Film & Stage, Gaming, Heavy Civil, Interior Design, Kitchen & Bath, Landscape Architecture, Urban Planning, Woodworking, Other. The objective of this extension is to explode all the groups and components along with all nested instances inside a selection or the whole drawing. This Extension comprises of the following two robust tools. Implode_All: Explodes all the groups/components which are contained in your drawing. • While importing outside models which should have been equally cleaned or curtailed to a singular collection or entities. It is mostly effective in the following case. • if your require to clean imported models which already exists inside your workspace. • As soon as the exploding process is completed, this tool provides you the option of gathering all the loose entities in a new group or releasing them. It signifies that one can both visually reassure yourself that the operation was successful (through outliner) and/or make sure that none of the entities are lost in among the implosion and your consequent command. Natale Zappia has developed nz_Parabola, the newest sketchup extension. It is compatible with SketchUp 2016, SketchUp 2017, SketchUp 2018. This sketchup is useful for Architecture, Construction, Education, Engineering, Gaming, Interior Design, Landscape Architecture and other sectors. It is used to draw a parabola set with the base width and overall height. Each Parabola is distinctively drawn on the basis of particular dimensions. A Parabola is equivalent to Projectile Motion, from flightpaths to fountain spouts. Height & Width is described on screen. A Facet-Factor is applied to manage the number of facets which develop the parabola. A value of <=1 is perfect, also the number of faces varies dynamically to accommodate the size of the parabola. To learn the complete process, watch the following video tutorial. FTC Solar Inc. comprising of a team of devoted renewable energy professionals, just unveils the next generation release of its proprietary SunDAT Solar Design Automation software solution. SunDAT v3 renders extremely precise designs out of small residential systems to multi-hundred MW Single Axis tracker utility-scale projects. With the addition of the new v3 user interface, the users can use an advanced feature to streamline the solar design process as well as generate various design iterations for comparison and appraisal. With energy modeling supported with NREL SAM, production estimates are tallied alongside for several layout options. SunDAT v3 considerably accelerates the speed and accurateness of big scale solar design. All modeling is performed within the Sketchup 3D environment. Shading analysis conjoined with 3D terrain-following facilitates the users to analyze the effect of terrain on energy production. “With advanced topography analysis, the users can get the ability to recognize the terrain over structural tolerances throughout the due diligence stage and have estimation of cut/fill volumes. By obtaining this feature in the initial design cycle land selection and cost estimation are improved radically. SunDAT V3 automates the layout and drafting tasks and the engineers get the ability to optimize cost and constructability. 3D Design Studio and Photorealistic Rendering is the newest sketchup plugin that is packed with various types of extras to produce renderings, reports, and instructive client presentations. It is compatible with SketchUp 8, SketchUp 2013, SketchUp 2014, SketchUp 2015, SketchUp 2016, SketchUp 2017, SketchUp 2018. This sketchup plugin is utilized to create photorealistic rendering with special modeling tools. ArielVision – Robust but user-friendly rendering package for SketchUp. The 3D Design Studio comprises of IRender nXt for Photorealistic Renderings, RPS 3D Placement Tools, SpaceDesign for Attributes and Custom Reports, Interactive 3D PDFs, Non-Photorealistic Rendering etc.